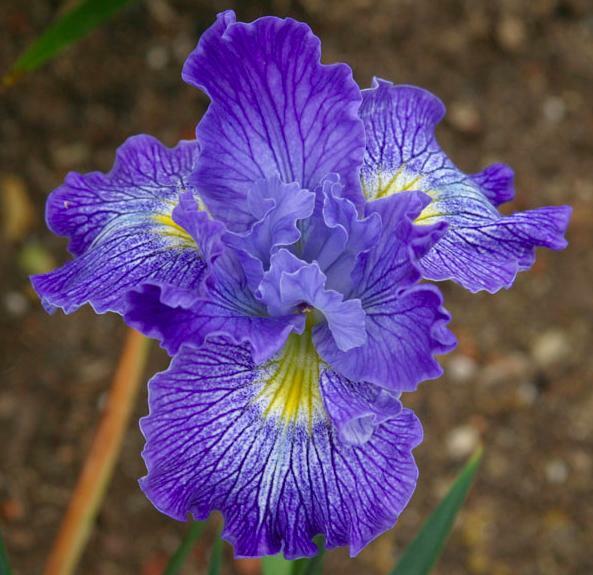 'Ocean Blue' (Joseph Ghio, R. 2002) Seedling #CP-56N2. CA, 13" (33 cm). Early midseason bloom. White ground, heavily washed and lined overall with medium blue, falls with yellow dot signal. Seedling #AP-193ltbl: (seedling #PB-247G5: ('High Winds' x (('Wilder Than Ever' sibling x 'Sierra Dell') x unknown)) x 'Marine Magic') X 'Pacific Miss'. Bay View 2003. Honorable Mention 2007, Award of Merit 2010, Mitchell Medal 2012.